Wuthering Heights told through the lens of the traditional Japanese true novel, this story within stories touches the heart of class relations and unrequited love. You get all of the drama of Bronte’s characters without the need to hate them and such restrained poetry that it will haunt you long after you finish--after all, what is true? The winner of Japan’s prestigious Yomiuri Literature Prize, Mizumura has written a beautiful novel, with love at its core, that reveals, above all, the power of storytelling. 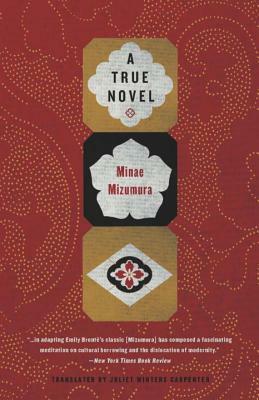 Minae Mizumura is one of the most important novelists writing in Japan today. Born in Tokyo, she moved with her family to Long Island, New York, when she was twelve. She studied French literature at Yale College and Yale Graduate School. Her other novels to date are Zoku meian (Light and Darkness Continued), a sequel to the unfinished classic Light and Darkness by Natsume Soseki, and the autobiographical Shishosetsu (An “I” Novel from Left to Right). She lives in Tokyo. Juliet Carpenter studied Japanese literature at the University of Michigan and the Inter-University Center for Japanese Language Studies in Tokyo. Carpenter’s translation of Kobo Abe’s novel Secret Rendezvous won the 1980 Japan–United States Friendship Commission Prize for the Translation of Japanese Literature.